We have 14 fully self-contained non-smoking units of various sizes to suit everyone's needs. 10-minute drive to Waipawa which is the oldest inland town in the Hawke's Bay. We can easily accommodate and specialise in providing accommodation for your wedding or conference party. 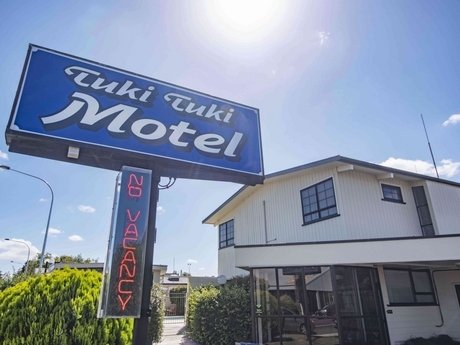 The Tuki Tuki Motel is centrally located to all amenities (2 minute walk to the main street) including cafés, restaurants, a shopping centre with boutique shops and art gallery, A W Parsons Indoor swimming pool, sports complex, childrens play area, splash pad & skate park, supermarkets and a petrol station. Adjacent to Subway Restaurant and alongside DAX Restaurant. We have 14 fully self-contained non-smoking units of various sizes to suit everyone's needs. Sleepyhead Executive beds in all units. 10 of these units have air-conditioning/heat pumps for your added comfort all year round. All rooms are serviced daily with fresh towels supplied and tea and coffee-making requirements replenished. Fresh milk is supplied on arrival so you can enjoy a much-needed cuppa with a biscuit after a long drive. 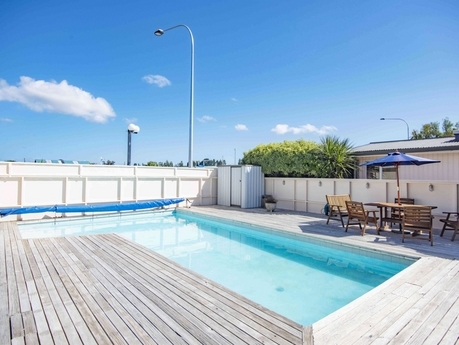 An outdoor swimming pool is on site for guests to use free of charge, much appreciated in the Hawke's Bay summers (Closed April - November). Both cooked and continental breakfasts can be catered and delivered to your room. Free high-speed WiFi is supplied or enjoy watching your favourite movie or sport chosen from the Sky Guest Select 50+ Channels available in all units. Free off-street parking for vehicles. Lock up facilities available for motorcyles and bicycles if required. 4 of our motel units are stand alone (3 studio rooms and 1 two bedroom unit) suitable for short or long term stays for guests working in the area. Ample off street parking for work vehicles including trailers. Waipukurau is situated within the picturesque Central Hawke's Bay area famous for trout fishing in the Tuki Tuki River (a 5-minute walk from the motel). 5 golf courses within the area to choose from. Numerous beaches within a 40-minute picturesque drive from the motel. Bring your bike and cycle the countryside or take in one of the cycleways along the Tuki Tuki River bank, cross over the swing bridge and onto Waipawa for a coffee. Great new mountain bike park to test your skills. Ring or book direct on this website for the best deal. We can accommodate you in the room best suited to your needs and budget.